That’s the way the Israel Antiquities Authority press release this morning begins. Teasers had caused us to believe that something big was coming. Now we have more details that can be shared. 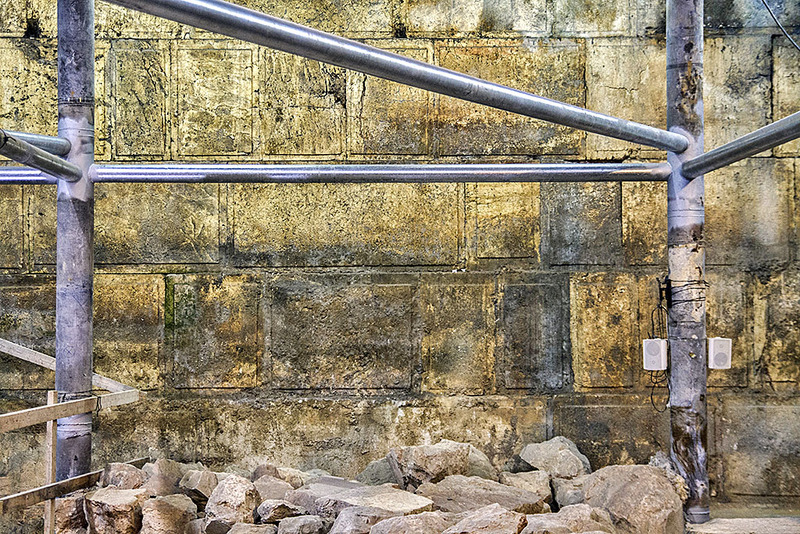 Eight courses of the Western Wall were discovered in the excavation. Photograph: Yaniv Berman, courtesy of the Israel Antiquities Authority. 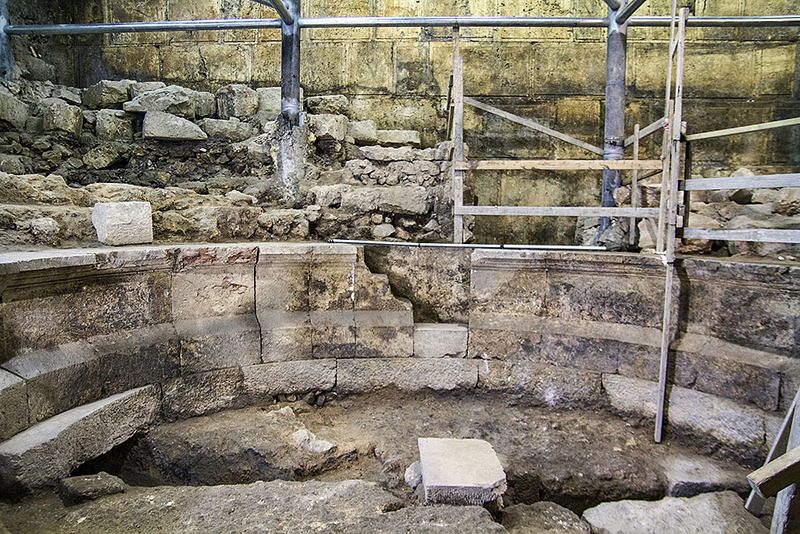 Israel Antiquities Authority excavation showing the theater-like structure. Photograph: Yaniv Berman, courtesy of the Israel Antiquities Authority. 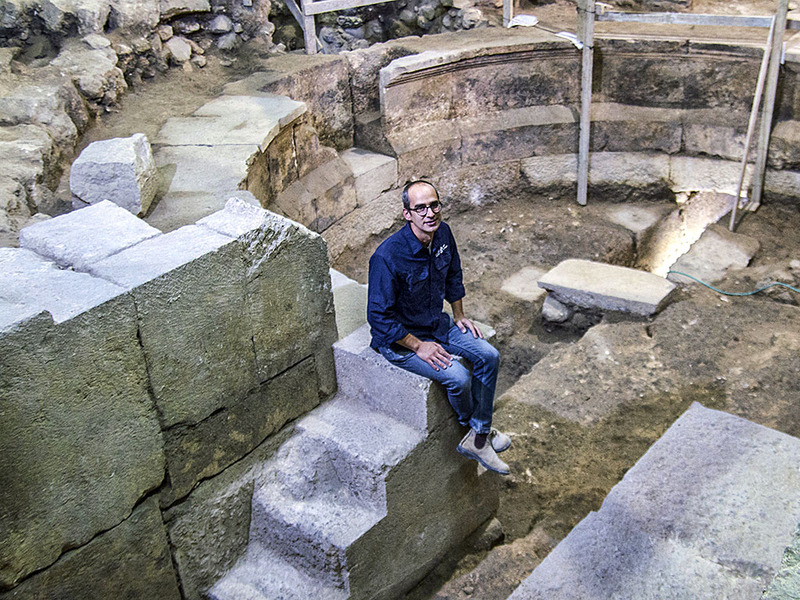 Dr Joe Uziel of the Israel Antiquities Authority, sitting on the steps of the theater structure. Photograph: Yaniv Berman, courtesy of the Israel Antiquities Authority. 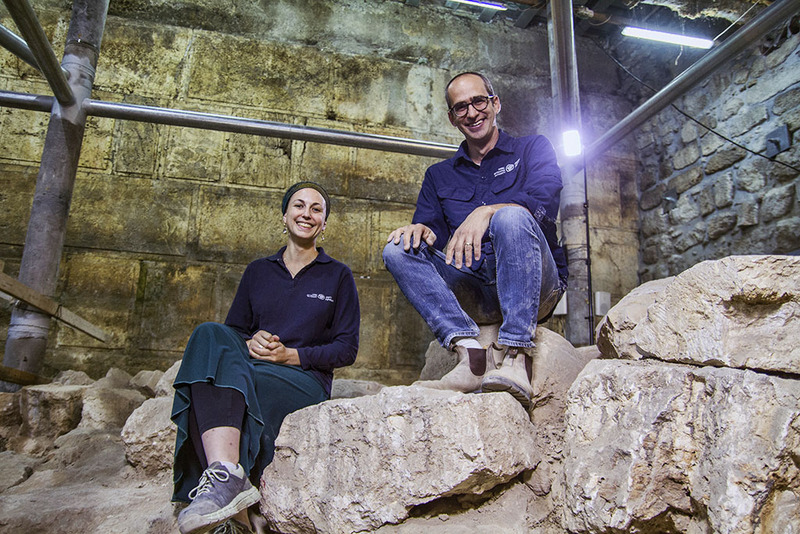 Israel Antiquities Authority excavation directors Dr. Joe Uziel and Tehillah Lieberman at the excavation site. Photograph: Yaniv Berman, courtesy of the Israel Antiquities Authority. Numerous findings have been unearthed in the excavations beneath Wilson’s Arch, some of which are unique, including pottery vessels, coins, architectural and architectural elements, and more. Advanced research methods from various fields were employed to uncover remains invisible to the naked eye, but only viewable through a microscope. This enables conclusions to be drawn at a level of precision that would have been impossible in the past, transforming the study of the findings at Wilson’s Arch into pioneering, cutting-edge micro-archaeological research. The major Israeli papers have covered this announcement, sometimes with their own photos, and I expect that other news outlets will do the same. Here are links to The Times of Israel, Haaretz, and The Jerusalem Post articles. Todd Bolen has summarized the information here, and Luke Chandler has included many other photos showing the Western Wall Plaza here. This short video (less than 4 minutes) will give you a good concept of the newly excavated area. Northern Israel is experiencing one of the worst droughts in 100 years, leaving the country’s water tables with a deficit of 2.5 billion cubic liters of water, compared to non-drought years, Water Authority spokesman Uri Schor announced on Monday. The Sea of Galilee is currently at 214.13 meters (703 feet) below sea level, or 1.10 meters (3.6 feet) below the lower red line. She adds that the Sea of Galilee reached a similar level in 2001 and 2008. When I first studied Bible Geography back in 1953 we learned from popular Bible atlases that the Sea of Galilee was 596 feet below sea level. 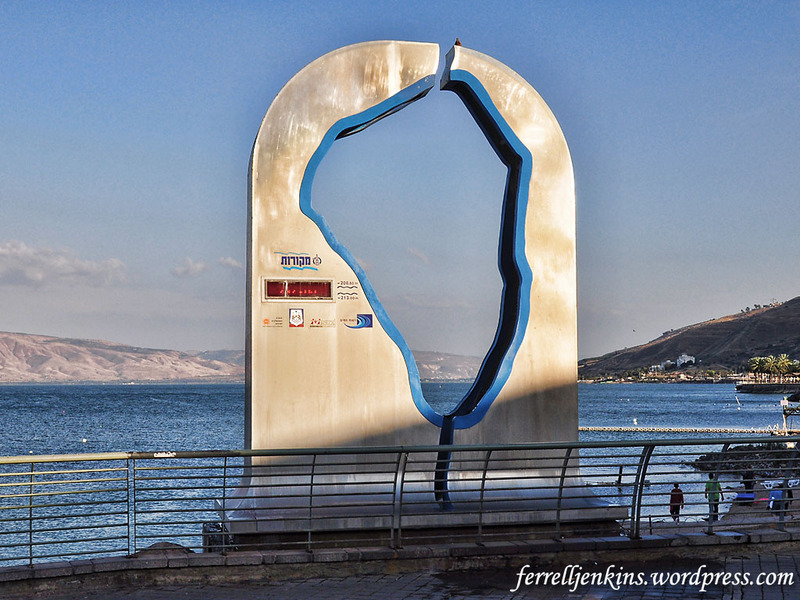 This gauge at Tiberias measures the level of the Sea of Galilee. Photo by Ferrell Jenkins. The article discusses the social and climatic problems Israel is facing today, and is well-worth the read. 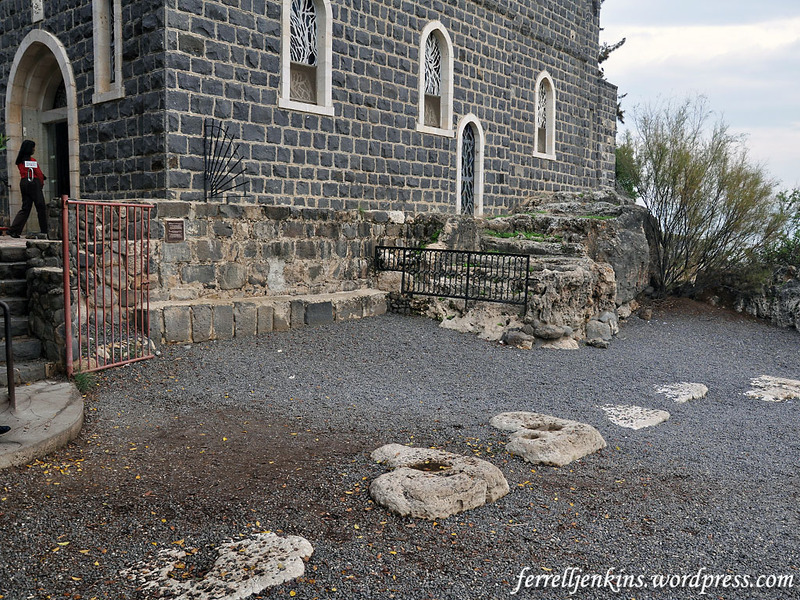 The late Mendel Nun, of En Gev, discovered no less than 16 bustling ports from the time of Jesus. When the harbors and anchorages were originally built the water level was about 695 feet below sea level, considerably lower than in recent time. (See “Ports of Galilee.” BAR 25:04, July/Aug 1999). Droughts in recent years have brought about changing water levels. We know that the famous Roman boat now displayed at Nof Ginosar was found when the water level was low in 1986. This also allowed the discovery of additional ports. During the time I have been visiting Israel (since 1967), I have seen these changes in the water level of the lake and have mentioned it in several posts. Here I wish to use Tabgha (Heptapegon = the place of seven springs) as an illustration. The Church of the Primacy of Peter was built in 1933. 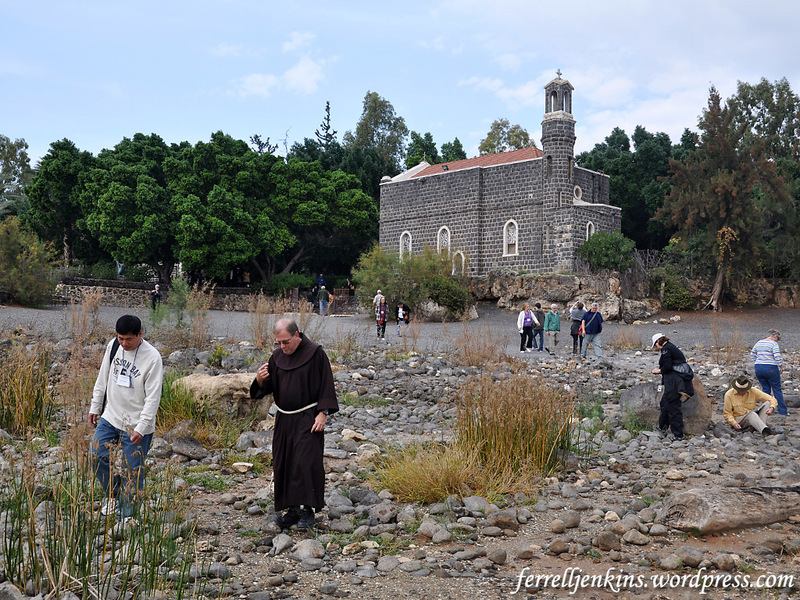 A good case can be made for this being the location where Jesus called some of His disciples to become fishers of men (Luke 5:1-11), and where Jesus met His disciples after the resurrection (John 21). The issue of the primacy of Peter over the other apostles is a matter for theological and exegetical study which I think comes up short. The chapel is built on a large rock called the Mensi Domini (the Lord’s Table) where it is said Jesus prepared breakfast for the disciples. In this 1980 photo you see the water reaching the building. 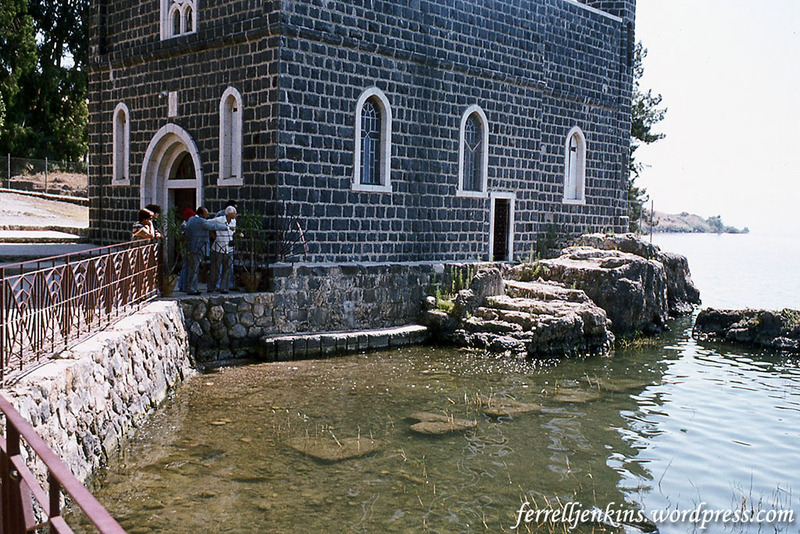 This photo shows the water level in 1980 at the Church of the Primacy. Photo by Ferrell Jenkins. The rock-cut steps were mentioned by Egeria (about AD 383), but we do not know when they were cut. Now take a look at the same location in December of 2009 when the water was low. The Church of the Primacy in 2009. Photo by Ferrell Jenkins. These 2009 photos were made during a personal study trip with Leon Mauldin. While we were enjoying the quietness of the experience a group of tourists came to hunt for a special souvenir rock or shell to take home. I made the next picture from the edge of the water to illustrate how far the water had receded. These photos were made during a personal study trip that Leon Mauldin and I made in 2009. While we were enjoying the quietness of the experience a group of tourists came to hunt for a special souvenir rock or shell to take home. I made the next picture from the edge of the water to illustrate how far the water had receded. View of the Church of the Primacy from the edge of the water. Photo by Ferrell Jenkins. Hopefully this illustration from Tabgha will allow us to see how the harbors that had become lost in time could become known in the past few years.